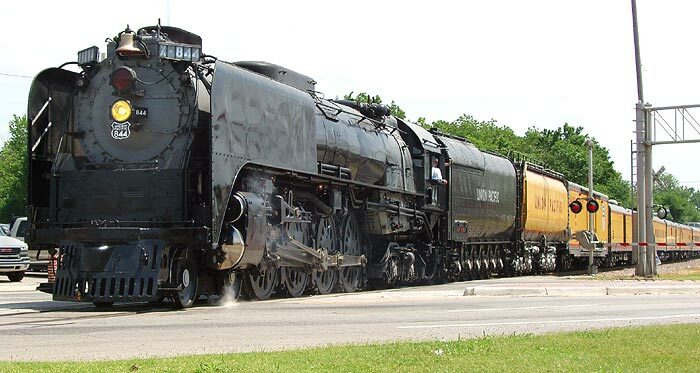 This is the second of four posts about Union Pacific's classic steam locomotive, 844, and its South Central Heritage Express Tour. The first post dealt primarily with the locomotive as the train passed through Salina, Abilene, Herrington and Hutchinson Kansas April 29-May 1, and may be seen here. 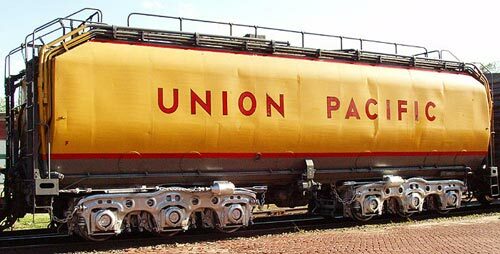 Since that time, Union Pacific graciously granted writer Patsy Terrell and myself permission to ride aboard the train on its return trip across Kansas as it worked its way back to its base in Cheyenne, Wyoming. 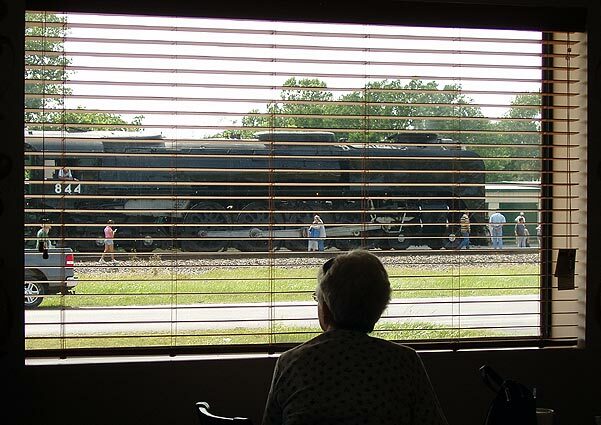 We were given clearance to board the train on May 28 in Claremore, OK and ride it all the way to Kansas City. 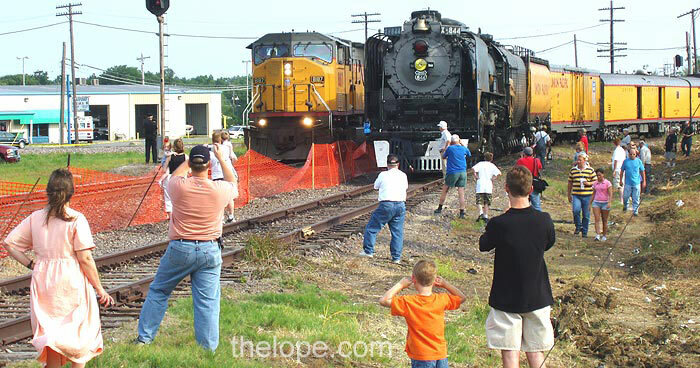 I drove to Claremore the previous day, May 27, to watch 844 come into town for the night. Here it is crossing Lynn Riggs Blvd - the two-lane routing of Route 66 in Claremore. It isn't a particularly photogenic location, but I couldn't resist the chance to cross two popular interests: trains and the mother road. 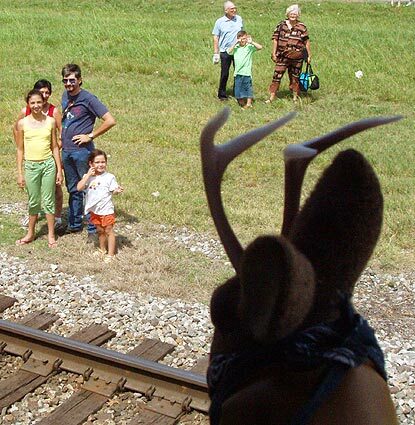 Passengers wave to the assembled crowd; the next day we would get to know the lad on the left. 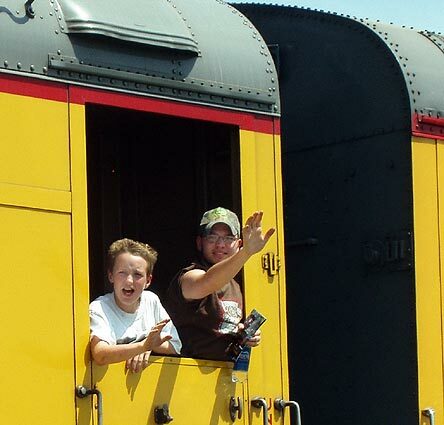 As usual, the Union Pacific's 1944 Northern class Alco steam locomotive was a hit with all ages. At every stop, the locomotive must be lubricated. Gripado's restaurant was right across the street from the siding at which the train rested. Sightseers, including me, stopped in to enjoy the air conditioning. I bought quite a few cold beverages from them during the course of the afternoon and noticed that it looked like a nice stable place with good food. One must always note such things for future road trips. Gina Gripado works at her family's restaurant. She was thrilled to see the steam engine as it reminded her of a steam-pulled train trip in the French Alps a few years ago when, against the advice of her fiance's father, she stuck her head out a window and got "shumtzed with coal dust." Many of the train's stops are in places not built or suited for passenger travel so footing just off the train is a challenge, but most people don't seem to find it much of an obstacle. 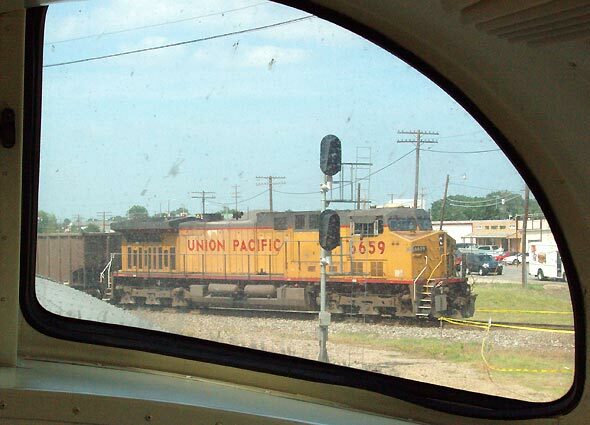 Here, a Union Pacific freight passes by. 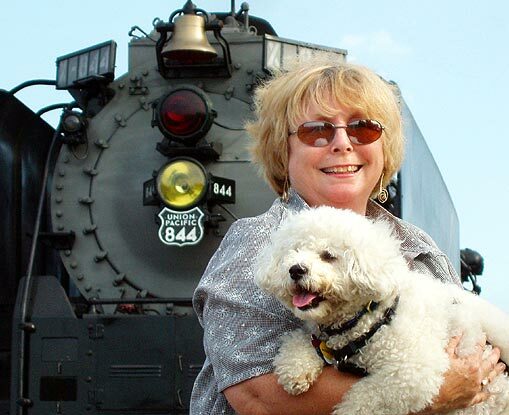 Marty Foster and "Barley the choo-choo dog" didn't know the steam engine was coming. The Cookeville, TN resident was visiting a friend of her family in Waggoner OK, south of Claremore, when she heard the whistle and gave pursuit. As long as I was there, I asked permission to scope out the train for the next day's journey and was kindly allowed to do so as the train was moved about into its position for the night. 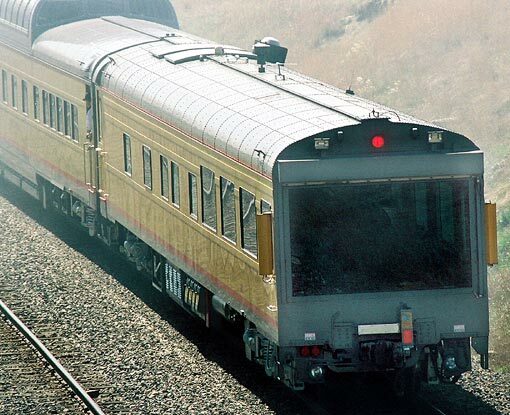 I have been sent a few questions about the passenger cars since the last post so I will attempt to describe them here. I knew locomotives generated interest but questions about the coaches were a surprise to me. There were four train cars we would be moving throughout. The trailing one is the Idaho, which was built by American Car & Foundry in 1950 as a bedroom car named the Western Mountain. 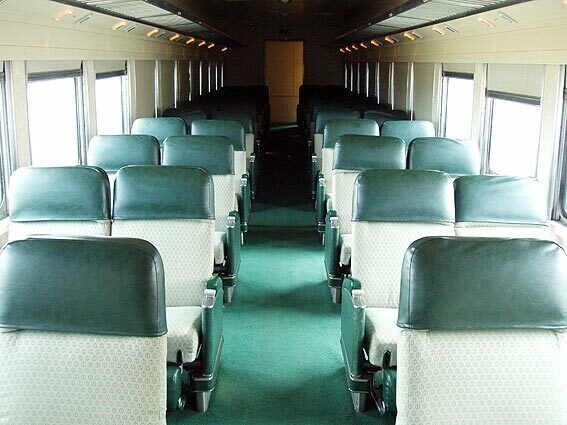 It was rebuilt by Pullman Standard in 1965 and renamed the Sun Lane before being converted to the track inspection car, Idaho, in 1980. Track inspection may be the Idaho's real purpose, but the huge rear picture window is well suited to sightseeing for riders of excursions. I photographed it from the Kansas Highway 77 overpass as it approached Herrington on May 1st. The Idaho has 24 stadium seats facing a large picture window. Between the rear window and a few side ones, the view is virtually panoramic. The UP website explains a few tidbits about Idaho and its economic history with the railroad. For example, sometime after track was laid through the state in 1883, the railroad began marketing "Idaho baked potatoes" on dining car menus in hopes of increasing their popularity and thus increasing freight traffic. Today, entire trainloads of Idaho potatoes are hauled, both whole or processed as french fries. I'll think of this the next time I see a parent trying to feed a kid a french fry with that "here comes the train" routine. 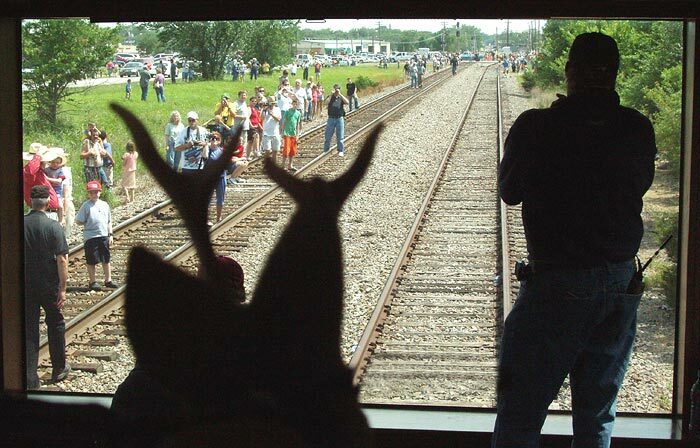 During all this jockeying around of the train, we were surrounded by railfans. 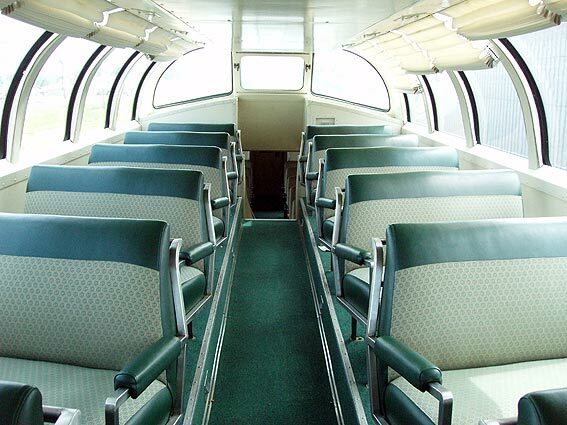 Foreward of the Idaho is the Challenger, a dome coach built in 1958 by Pullman Standard. According to UP, it was the last dome coach built. It must have left their ownership at least once because their website refers to it as having been "reacquired" in 1989. 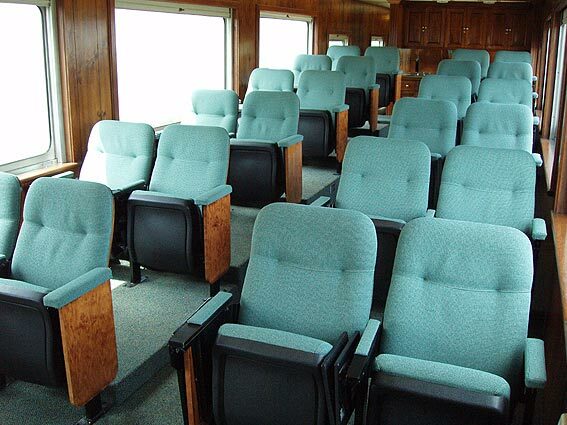 The coach was named for the Challenger passenger trains, which had their genesis in the middle of the Great Depression when they were known as the "Everybody's Limited." 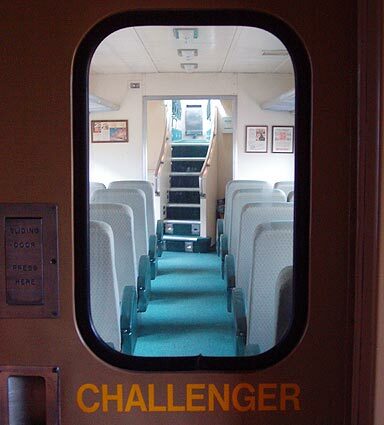 The Challenger was designed to draw people back to the rails with an economical level of service. The meal service was advertised as "three meals for under a dollar a day," in contrast to the first-class fare streamliners, where one meal might cost $1.25. When dome cars came into use, the Challenger was renamed the Challenger Domeliner and ran until 1971. "The introduction of the Challenger also started the use of registered nurse stewardess service in August 1935. These single women were charged with first-aid service for the entire train, but their main function was to assist women with small children and children traveling alone. They were paid $125 per month plus expenses. There were exclusive coaches for women and children which were placed at the head of the train, thus eliminating the need for men to even walk through the cars." I liked the curved aesthetics of the dome; it reminded me a bit of late 1950's googie architecture. The Challenger's upper deck would be a comfortable roost the next day; and its dome would be great for viewing railroad operations. 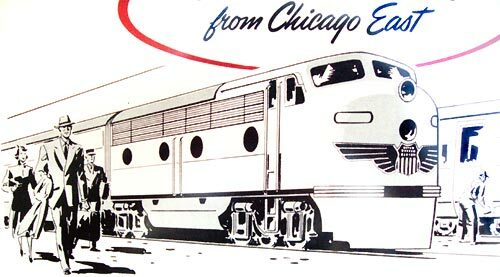 Foreward of the Challenger was the Texas Eagle, a passenger coach built by American Car & Foundry in 1954 as 44-seat coach No. 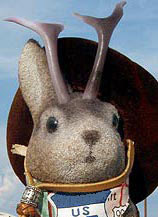 5483. 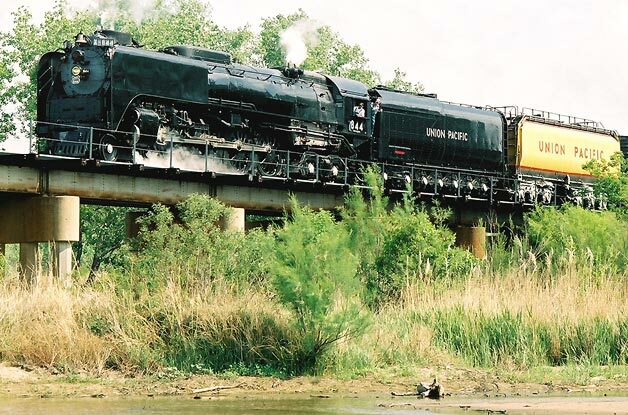 It was named the Texas Eagle in 1990, presumably in honor of the Texas Eagle passenger trains of the Missouri Pacific Lines, which ran from 1948 to 1971. The Union Pacific bought the Missouri Pacific (MoPac) in 1982 and I found it appropriate that this coach was included on the train as we were traveling on ex-MoPac track. This was a very comfortable coach, but, at least when we were there, it was the least used. I guess you can't compete with a dome or a rear window. 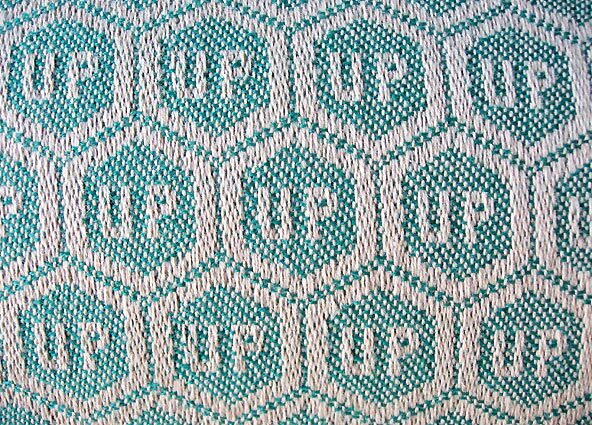 Neat upholstery, huh? This was found throughout the rail coaches. Foreward of the Texas Eagle was a concession car, the Sherman Hill. It was built in 1961 by the St Louis Car Company as a railroad post office, and served several other functions before becoming the place where we could buy cold pop, and souvenirs. The name "Sherman Hill" comes from a hill in Wyoming that is popular with railfans who like watching the UP. 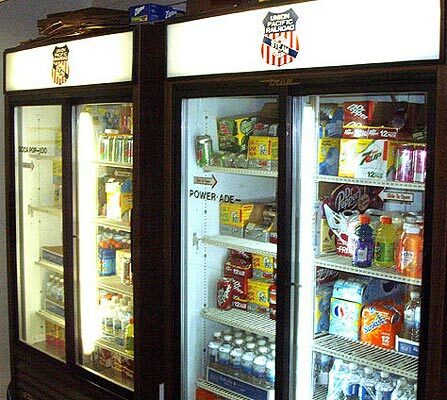 The Sherman Hill was fully stocked when I saw it in Salina at the end of April; by May 28th they were running low on some things. As we were pretty much at the end of the tour, they must have gotten the inventory about right. 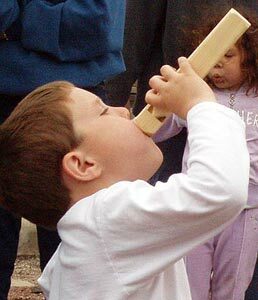 These wood train whistles were very popular and quite loud, as this young man in Salina last month was discovering. 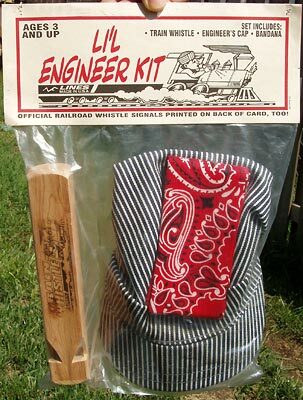 I bought one in a "L'il Engineer Kit" for my girlfriend's niece and nephew; I hope their parents still speak to me. I loved the innocent retro graphics on this package. In addition to belt buckles, hats, t-shirts, book, magnets, etc., they also sold these cool pins with which Ace was able to disguise himself so as to be indistinguishable from the average railfan. 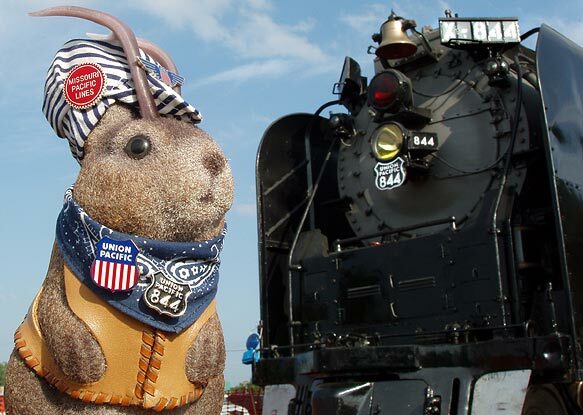 Note that he wears a Missouri Pacific pin to signify that the trackage used for tomorrow's journey was once part of that now-defunct railroad. Between some of the cars, the vestibule was open. These were great observation points. Scattered about the train were framed advertisements from the golden age of rail travel. Ironically, this one portrays the type of diesel streamliner that spelled the end for steam passenger locomotives. 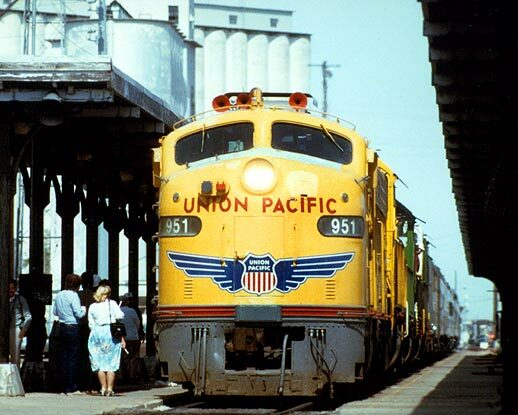 Union Pacific still owns two such locomotives, E-9s built by General Motors Electro-motive Division in 1955. I photographed number 951 in Newton Kansas in the mid 1980s when it was pulling Operation Lifesaver, a crossing safety awareness train. Back when streamliners were in wide usage, this one pulled such trains as the City of Los Angeles, City of Portland, City of San Francisco, City of St. Louis, and the afore-mentioned Challenger. Although we did not enter it; I did peek into the Art Lockman, a maintenance tool car. 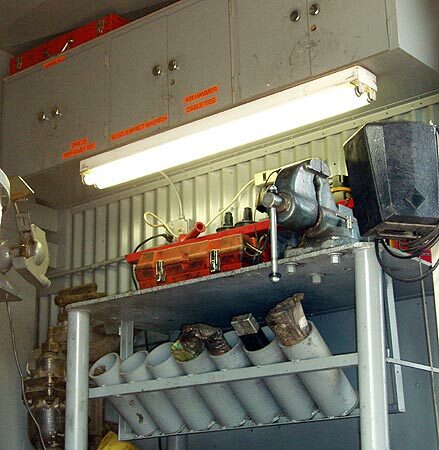 The train carries not only spare parts for 844, but tools to maintain it and fabricate many things which might be needed. There was also a baggage car, the Golden State Limited, a boiler car, the Howard Fogg and a boxcar, UP 9336, but we did not explore those. After my initial 844 post, I had two questions from readers about the tenders. Here's a shot from Hutchinson, KS May 2, which shows both the black and yellow ones. The black tender right behind 844 carries 6,000 gallons of fuel (no. 5 oil) and 23,500 gallons of water. The yellow tender carries about 30,000 gallons of water for 844. 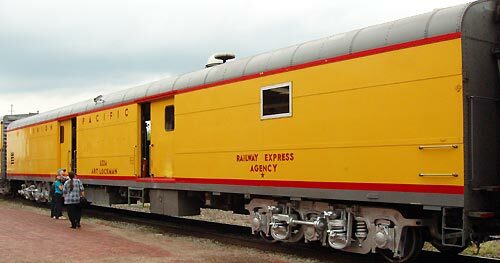 It is yellow because its last job was as a fuel carrier for Union Pacific's gas turbine locomotives and such locomotives were in the yellow paint scheme. Before that, the tender (no. 809, I believe) served steam locomotives of the 4-8-4 class and was black. It was actually built back in 1937. I just found something on the net that may indicate the tender will be changed back to its steam era appearance. 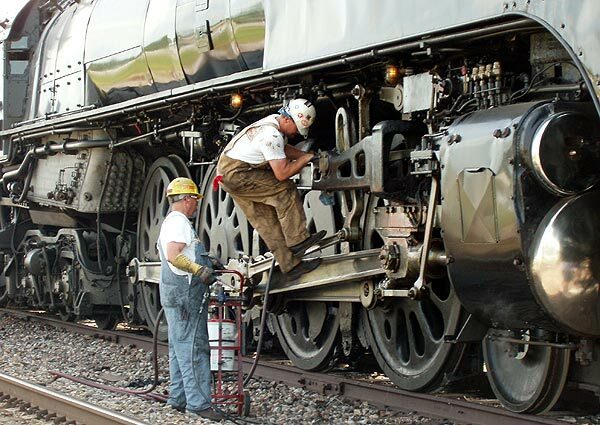 Wasatch Railroad Contractors has been hired to remove the remaining equipment used for the turbines and return the tender to an appearance more conforming with its duty as a companion to a steam engine. They have already begun the process on 809's sister unit, 814, as seen here. UP had experimented with gas turbine locomotives from 1949 to 1970. They were immensely powerful and desirable for long hauls as long as their specialized "Bunker C" fuel was less expensive than diesel. However, they were loud enough that they gained the nickname "big blows" because their volume was likened to that of a jet engine, so they were not used in areas like Los Angeles. Their economy also dropped at low speeds, at which diesels were more efficient. Eventually, the energy crisis of the 1970's doomed them with high enough fuel costs as to become uneconomical. 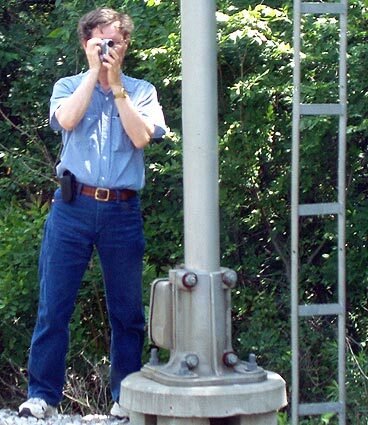 I saw UP turbine #18 in Kansas City in the mid-1980s; it now resides in the Illinois Railway Museum in Union, IL. Finally, I was asked for a better shot showing wheel arrangement. Here is one from Hutchinson, May 2, in which you can more clearly see the wheels in the 4-8-4 arrangement. 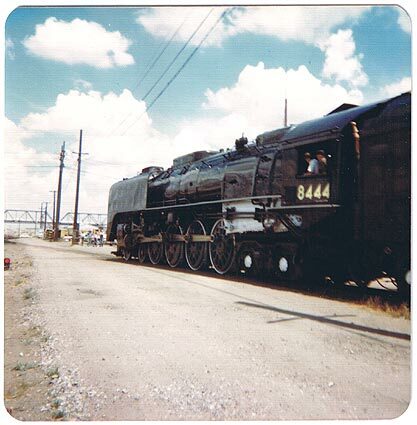 I have a bit of history with 844; I saw it for the first time in Denver, CO nearly 30 years ago in the summer of 1976. I was 15 years old and this was taken on my first camera, a Kodak Brownie that used the long-gone 127 film format. 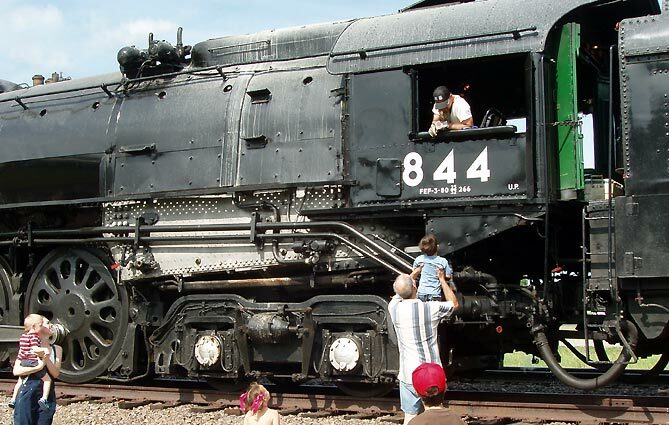 By 1985 I was a professional newspaper photojournalist and was covering 8444 in Salina, KS, when the locomotive was painted a bit differently and had an extra "4" in its number. 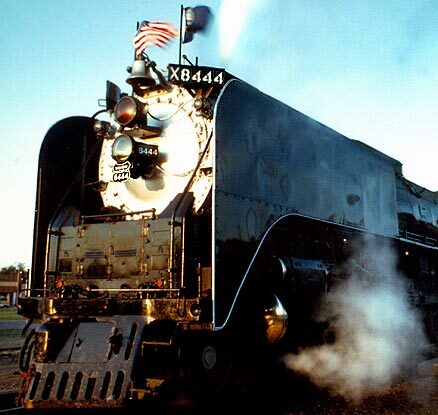 "844" is the number it was given when built and delivered to the Union Pacific in 1944. 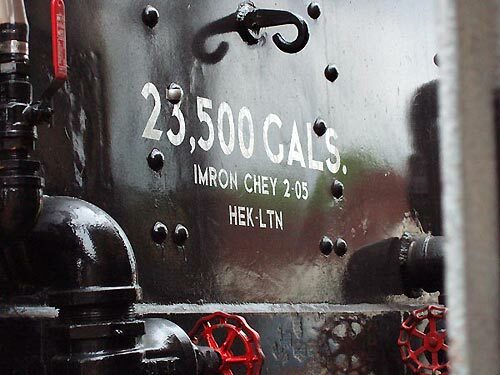 After UP's steam fleet was mostly retired, they gave the 800 numbers to new diesels. Thus, in 1962, the number "844" was given to the GP-30 diesel seen below, and the steam engine formerly known as "844" became "8444." When the diesel was retired, the extra "4" was dropped from the steam engine. By happy coincidence, I photographed the diesel 844 last May in Boulder City Nevada, where it resides after being donated to the Nevada Railroad Museum by the Union Pacific. The diesel 844 is a General Motors Electro Motive Division (GM-EMD for short) GP-30. 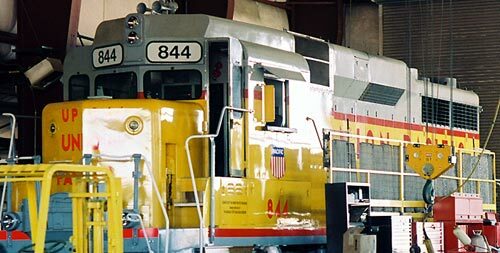 Both 844s are "the last" in some way: in 1944, the steam engine was the last one delivered to the Union Pacific and, in 1989, The diesel was the last GP-30 retired from the UP. And so, 844, by any other name, had been popping up in my life for thirty years, about half of the time of its existence, and two thirds the time of mine. Through contact with it, I was discovering why the older railfans pined away for what had been lost: a steam engine is a beautiful, almost living thing. I had never ridden behind it, though. That would come the next day, and I was excited. Next 844 post - Riding the Iron Horse. This should be up by Friday, June 16. Nice, very very nice link. I like its page. Congrtulations.